A native of Punjab, India, Pardeep Singh Kaleka grew up in Milwaukee and received his B.A. at Marquette University, and M.S. at Alverno College. As a former Police Officer and Educator in the inner city of Milwaukee, Pardeep understands the difficulty facing our communities. Today, as a therapist his specialization is in holistic trauma-informed treatment with survivors of assault, abuse and acts of violence. Both in his practice and out, Pardeep’s passion remains one of healing and recovery. As a first generation immigrant Pardeep’s approach to dual cultural identity issues creates constructive cultural agility and dialogue to bridge gaps between diverse communities. 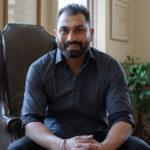 Pardeep is an author of “The Gift of Our Wounds” and in 2012 he founded Serve 2 Unite, an organization that engages communities in local and global peacemaking by utilizing service learning, artistic response, and global engagement to address violence, conflict, and radicalization from a trauma-informed lens.